NOTE: v0.2.6 and v0.3.1 build on Cygwin. The versions between v0.3.1 and v0.4.0 do not. Since v0.4.0 node builds again on Cygwin. Since v0.4.3 node requires gcc4-g++ on Cygwin. This tutorial will guide you through setting up the latest stable version of node.js on Cygwin. You don’t need to have a working Cygwin install. You can use the search box at the top-left to locate packages quickly. It is recommended you checkout a stable tag since most of the time building master fails. If you receive an error at any of the above steps, look further down for possible solutions. For Vim newbies: use i to enter insert mode, <Esc>:wq to exit insert mode, enter the command window, write and quit. If you are uncomfortable with Vim, use nano /etc/resolv.conf instead. Note even if /etc/resolv.conf is correctly set to Google DNS, ECONNREFUSED will happen on .listen() if Windows is not connected to the Internet and you attempt to listen at localhost or the machine name (ie. joeslaptop etc.) Only workaround for offline Windows (such as a development VM) to successfully .listen() at the local host is to use 127.0.0.1 explicitly, neither localhost nor the machine name will currently (0.4.5) resolve when offline. If you cannot ping the Google DNS IPs listed above (because of a firewall, for instance) you will have to use different IPs. Open a DOS prompt and run “ipconfig /all”, which will list the DNS servers that Windows is currently using. Try using those IPs (prefixed with “namesever “) in the resolve.conf instead. This is not an issue with node.js. You are using the Windows version of python in Cygwin. It doesn’t know how to process Cygwin style path names. You need to remove the Windows version (or make sure is not in the PATH) and install the Cygwin version of Python using setup.exe. Close your shell window and repeat the steps above. Once you are done, restart your PC. Remember to close all open Cygwin shells before using rebaseall. Exception: supported architectures are arm, ia32, x64 but NOT ‘x86’. You may also experience this problem when trying to build v0.4.0, try updating your version of gcc (v8 in v0.4.0 requires gcc-4.x to compile). You have to remove the old build files. sed -e '/cygwin1\.dll$/d' -e '/cyglsa. *\.dll$/d' -e 's/^/\//' >"$TmpFile"
sed -e '/\/sys-root\/mingw\/bin/d' -e '/cygwin1\.dll$/d' -e '/cyglsa. *\.dll$/d' -e 's/^/\//' >"$TmpFile"
Ajax IM has been truly rebuilt from the bot­tom up, imple­ment­ing the lat­est libraries, tech­niques, and shini­ness includ­ing jQuery, local ses­sion stor­age (using HTML5 or Flash), Node.js, and much more. Let’s get you set up, shall we? After downloading the latest version, extract the archive into its own folder. Upload all included files to your server. Change the permissions for config.php andjs/im.js to 755 (writable). Additionally, if you plan on using a library that uses the standalone Node.js server (NodeJS or NodeJS Guests), set the permissions for node/config.js to 755 as well. The install script will need to alter these files during installation (unless you handle installation manually). In your browser, navigate to install.php in the folder where you uploaded Ajax IM (e.g.,http://yoursite.com/ajaxim/install.php). The installer will guide you through the steps and configuration options for setting up Ajax IM, the database (if necessary), and the standalone server (if necessary). Note: After completing installation, deleteinstall.php. To use Ajax IM on your website, you’ll only need to manually include the im.load.js script in your pages. The script will automatically test for and include any of the dependencies and the main Ajax IM library. If you’re using the included MySQL database engine and the Default or NodeJS server libraries, you should read either the Quick Start with PHP or Quick Start with Node.js guides. That’s it! There really isn’t anything more to the installation. For more information about integrating Ajax IM with your database, take a look at the documentation; also be sure to check out the add-ons (coming soon) page for alternative server scripts, database engines, and modifications. Tomasz Janczuk and Steve Sanderson are having entirely too much fun. 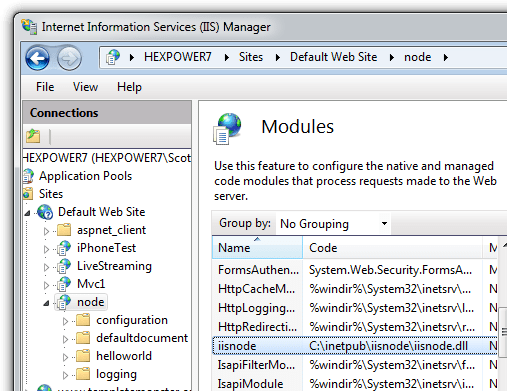 I posted just two weeks ago on Installing and Running node.js applications within IIS on Windows – Are you mad? when Tomasz and the team got node.js running rather nicely under IIS. Now they’ve got a nice little development environment in WebMatrix. Installing and Running node.js applications within IIS on Windows ?